Hunting has always been about harvesting food. Food to sustain life. Food to enjoy. Food that connects hunters, their families and friends with nature and the cycle of life. But life’s cycles have changed and as populations moved to urban settings and people lost contact with the land-based lifestyle, food became mass-produced, chemically-enhanced, bottled, wrapped and frozen. Later, as contemporary testing revealed that many foods contained ingredients that weren’t all that healthy, a movement was launched to find healthier fare. And along with that movement came a push to obtain more food locally, leading to increased knowledge of its overall nutritional and health values—the “locavore” concept. Appropriately, hunting has become an increasingly significant part of the locavore movement where a healthy diet is based on eating locally-grown foods with a lot less preservatives. Hunting is so much a part of this movement that several prominent conservation organizations now are offering education and training programs on how hunting can play a vital role in healthy eating. “Field to Fork” (FTF) is such a program, cooperatively developed by the Quality Deer Management Association (QDMA,) the National Wild Turkey Federation (NWTF) and the Georgia Department of Natural Resources' Wildlife Resources Division. Instrumental in designing the FTF program, Charles Evans, a representative with the NWTF's R3 (Hunter Recruitment, Retention and Reactivation) program, explains, "People are more conscious about the food they are consuming. Organic is by far the fastest growing segment of the food industry, supermarket chains like Whole Foods Market are gaining unprecedented popularity, and farm-to-table restaurants have become the place to be. These trends are being driven by “locavores” who want a deeper understanding of where their food comes from, and they prefer it to be locally sourced. Evans paired with Hank Forester, manager of QDMA's Hunting Heritage Programs, to assume the challenge of introducing locavores to the benefits of hunting for food in QDMA’s hometown of Athens, Ga. After some research, they based their inaugural event on a program initially created in Kentucky. The two set up a booth at the local farmers market, offering an impressive spread of samples of venison sausage, sliced backstrap with chimichurri sauce, venison jerky and a handout entitled, "Why Should You Hunt Deer?" "The reception was overwhelming," said Evans. "Everyone was curious. Most tried venison, and quite a few signed up to go hunting with us. In a matter of six hours, we reached program capacity with a substantial waiting list." Their FTF booth drew a diverse group of participants ranging from ages 18 to 47, all of whom shared a common desire to have a connection with the food on their plate. Those who signed up to learn more about the hunting experience gathered for evening classes where venison tacos were served. Material covered the hunter's role in wildlife conservation, an overview of deer biology and a safety lesson on the proper use of crossbows, the “harvest agent” of choice. In addition, a field component of the training addressed hunting strategies and provided ample shooting opportunities. Then FTF participants actually went hunting. Following the successful experience, FTF partners hosted a “culinary social” for the participants, guides and representatives from the partnering organizations. They enjoyed a variety of venison dishes, including grilled backstrap from one of the new hunter's first deer. Forester said the FTF farmers market experience in Georgia revealed how receptive people are when approached with a “Would you like to try some venison?” invitation that connected with the attendees’ interests in food. He also observed that those who responded were largely adults, who have the means to hunt, making this kind of approach effective in opening the door to hunting. From the beginning, the FTF was established as a model program the other hunters can replicate. To date, similar events have been tested in Michigan, Wisconsin, South Carolina and, of course, Kentucky. 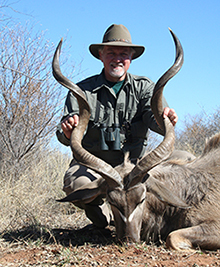 For American hunters, the success of such a program is no surprise. After all, when it comes to eating locally grown and produced food, what could be healthier than bagging your own buck? To learn more about the “Field to Forks” program, click here or contact Hank Forester at 800-209-DEER.